In the decades leading up to 2012, the end of a very large cycle of time, and a 33 year journey through the dark rift in the Milky Way, we re-birthed, re-modeled, re-hashed, re-claimed, re-mapped, re-booted, and re-membered. We just about re-did everything and looked deep into our hearts with an electron microscope. But that process is over. It is fading into a dim memory. Our work is done there, and what we have done cannot be repeated. Today we are in a new age, frequency, dimension, bandwidth, reality and perspective. What was . . . is gone, and there is no going back. For most of the conscious community, the universe has hit the pause button, and we are in an odd place of suspended animation. We have gone back to the womb. This is a safe place for us while the Earth recalibrates to the new frequencies. We are in the incubation phase of a new cycle. 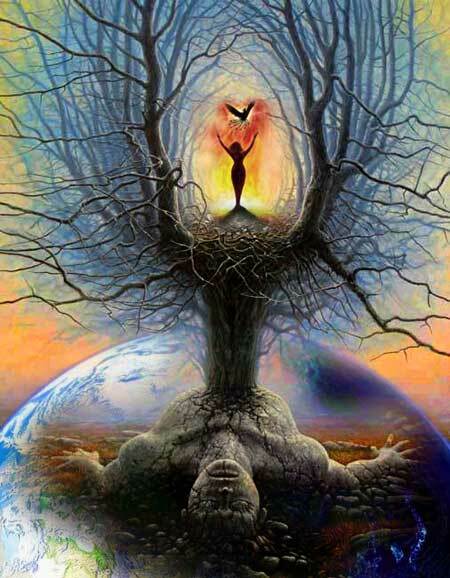 We are dreaming a new world while maintaining a body in the physical world. It is an oddly fascinating place to witness. It is like living and dreaming all at the same time. We are becoming familiar with the void and the unknown. Even though there is some oddly unsatisfying and unproductive searching going on, we also feel safe and secure regarding the eminent outcome to our incubation. We are collecting new tools for the future. We are gathering information that we will need for the new birth . . . And we can feel it coming. We are excited to begin to share the messages we received during our Maya 2012 pilgrimage. We hope they impact you in a positive and productive way. The following is the first message that we received in the Mayalands this past December over Solstice. You can find our other messages on our website at www.alunajoy.com under the "Articles for Personal and Planetary Transformation" link. It might be a good idea to read them in order as each message builds upon the previous one. We are sharing this message here with you just as we received it, in present time, with very little editing. We do this for a very important reason. We know that the messages that we receive are not just for our groups, but are for others as well. The the Star Elders assure me that the message and the corresponding energy will be transmitted to you. So as you read this, you might want to imagine that you are with us. Also, always view the photos on the website that we share, as photos also hold some energy of the sites. Aluna: The Star Elders and the Guardians want us to say, "Goodbye." Say, "Goodbye." Say, "Goodbye." (Everyone reading this can also say, "Goodbye.") Say Goodbye to who we were. Goodbye to all the blessings that we have had. Goodbye to all the sufferings that we have had. Goodbye to all the programs that we have been programmed. Say, "Goodbye," to the wounds, the betrayals, the gifts, the visions. Let it all go. Let the old world die away. Say, "Goodbye," to it, and say it with thankfulness. Also, be so thankful because we have been totally and completely blessed to be on this path and in this life. But we are ready. We didn't come here for this-the old world. We all know we are wired for the New World. That's why we have felt like the misfits, the black sheep of the family, the ones that never fit anywhere. That's why we have felt this way because we didn't come here for the world we have evolved out of. We came here for what is coming. So the Star Elders want us to say "goodbye" with so much gratefulness, because in this gratefulness we can open our hearts even further to receive what is new. When we say "goodbye," we empty out all that we thought we were, so we can receive truly who we really are-because we are still in an illusion, even though we have worked for the last 33 years through this dark rift in the Milky Way to awaken ourselves. We still only have a small glimpse of an idea of who we are and what we will become. So the Star Elders want us to stand here to say "goodbye" and also "thank you" for everything that we've had and the lessons we've learned. Say "goodbye" to who we think we are-what we see in the mirror in the morning-because that's not who we are. Let all that go because it's time for us to step into who we truly are; so when we look in the mirror, we are not limited by this physical form. We know that we are connected to everything. We are not limited by being encaged in this body. We are part of the trees. We are part of the earth. We are part of the rain. We are part of the sky. We are part of the stars. We are part of the Universe-all that is around us. This body is not who we are. This physical form is not who we are. We are so much more. He is busting the mirrors because we identify with what we see in those mirrors. In ancient days, no one had a mirror, thus people would feel their connection to everything. But when we look in a mirror, we identify with this physical body, and this clunky body isn't who we are. So Archangel Michael is busting all the mirrors inside of us, and erasing all the times that we have looked in the mirror and said, "Ah I'm getting gray," or "I have gained weight," or "I don't like my hair." All those self-judgments and all those stupid little things, even the tiniest little things we feel about ourselves. He is busting those mirrors, and he is being adamant about it. I have never seen him so impassionate about busting mirrors before. Anything negative we have ever seen in, or thought about, ourselves is going to be gone. We are all going to leave all those self-judgments here. We are going to put them all in the river, and they're going to wash away. The rain is going to wash it all away from us. We will be baptized anew. Everything that is not of use to us in the new world is getting washed away-getting dumped out. Anything that was less than Perfect-God-of-Who-We-Truly-Are is getting wiped away. It is being recycled into energy that we can reuse on the other side. Energy is never wasted. We have learned things. We gained precious tools. Those experiences are awesome. We don't want to lose that momentum. So the energy is going to be recycled into a higher vibration for us. Our bodies will not get recycled this time. We are taking these bodies with us. Taking our bodies is a new project for this new realm. Archangel Michael is going to tell our bodies that we are taking them along with us into 2013. But we are going to recycle our energy to a higher frequency. This will give us a clean slate to work with. So now when we get on the other side, (tomorrow) we can pick up that which we have collected and learned over eons-that which has been recycled into a higher vibration. We can now become who we know we really are, and not what society or our teachers or our parents or our families have said we are. So in that empty space within us where nothing is being said all we feel are the trees and the earth and the sky and the rain. It is all becoming part of who we are-because the biggest illusion of all is that we thought we were separate from all of this, and we never really were. We just forgot; and in this remembrance, we become one with everything again. Our energy in our hearts and our love and our peace and our harmony are all becoming a homeopathic inoculation for all life on Earth, whereby the healing of a few becomes the potent agent for the healing of everyone. So all the blessings that we receive from this point on and all the things we have learn are now homeopathic inoculations. All the life situations where we will put into practice the things we have learned are now homeopathic inoculations. All the times we have been challenged to choose between re-acting negatively or stepping back and reacting from love-offering a solution from love-all these times are now a potent energy that we are spreading across the planet. They are appreciating us for our humbleness and our wisdom of knowing that there is no "better or lesser than" on this planet. We know that we are connected to everything and there is a cosmic equality among all life. We also know that we are human and we make mistakes. This keeps us humble. We also know we are God, and we are all omnipresent and powerful. This keeps us confident. We encompass all of this. We now own all of this. We accept all of this. As we proceed here today, the Star Elders are going to start downloading some of the new energy and codes. But in this moment, they are clearing the past away from us. All the past is going away, so there is going to be lots of room for us to absorb new energy. The Guardians hope we can feel them in this moment, because they are so happy that we are here at this time (and those reading this). They can see our hearts. They are very pleased, and they are welcoming us back home. They are glad we are back. It is our job now to hold this love and oneness and equality within all the diversity, while we are here today and throughout our journey. They are sending us so much love. They love us so much. They are so proud that we held our ground and had the courage to be here in this time, because going through the dark rift of the Milky Way is no easy task. They say we are the "brave ones." We held onto that knowledge of knowing that we are all equal. There is no difference between race, religion, color of skin, social status, etc . . . it doesn't matter. We all have the same DNA. We all have the same God-light within us. They say that today they are going to help us activate this God-light and amplify this wisdom even further. But here (Aluna stamps her feet on the ground), we leave the past behind. It is dead and buried. We say, "Goodbye," and we say, "Thank you. It was beautiful." Since the beginning of the times, since our ancestors the Mayas and our ancestors the Egyptians and our ancestors the Druids, the Incas and all of our Forefathers who created these places, they created them to be and to live according to nature. Every place, every building, every stone was made according to a natural law, as we have seen before-in order to keep this connection and to be all the time in life and alive. As you heard from Aluna, we are part of the rain. We are part of the forest. We are part of the stones, of the birds, of the monkeys. When the Dark Age began, we left that awareness behind. Our world began a long time ago. We remember how our lives were when we entered in this spiritual path. We know how many challenges we had to go through, and finally we have come to this moment. So we can see how nature manifests that-the rain is washing all that we leave behind. We are being washed inside and outside. Usually whenever we enter this site and bring a group here with Aluna, the first thing I do with the group is to ask for permission to come in. For this very special trip, this permission was fore-granted months before. So we are allowed to come at any moment of any time, and the only thing I can say is to thank all the Great Spirits of the site. So I am going to do this thanksgiving ceremony, rather than a permission ceremony. This morning when we were told that the entrance was blocked-that was an illusion-that never existed. But we broke the illusion. We went through that illusion, and we finally see that the leftover of that Dark Age is still showing some shadows. But now we know that it is only that-shadows, illusions. The illusion has no more power. It has no more power because we know that it never existed. It was only in our minds. So we are going to manifest what we want from now on in every moment-from now on for the rest of the day, for the rest of the year, and for the rest of this physical life. We are going to transmit that truth to our beloved ones, to our families, to our children, to our friends. We are going to spread this light everywhere-to begin to form this new era of love, of peace, of harmony. We want to be one with nature, with our Mother Earth. On the Earth, nature manifests through us. That is why we are here. Oh Great Lord Hunab Ku, Creator of everything-the visible and the invisible. We are now at this point of our existence in front of you. We are now in front of your face, and we offer our heart to you. We thank you for accepting it, for letting us coming into your sacred site. We have done this travel through a long, long time, through a long distance in the space on the time, and we are now here in front of you. We thank you for letting us come and for showing us the path: for manifesting in our bodies, in our souls, in our minds. We are finally here, and we come to offer to you our presence in appreciation of all the gifts that you have given to us: our life, our health, our families, this beautiful world where we are. This is when we say the sacred expression that you taught to us-that we are all one. That I am you, and you are me. So everybody is part of Hunab Ku, "The One Being." 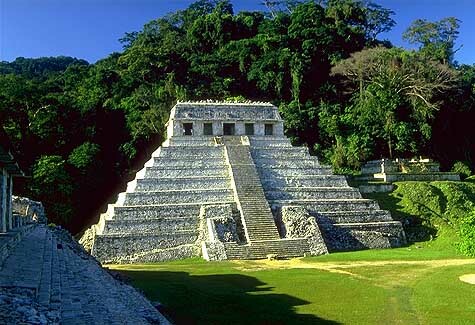 In this moment, I feel around us the spirits of the Mayan Lords and Ladies that were here. Around us you can see with your third eye how splendid in this city. All the buildings are nicely painted with colors. The Lords of here are coming to us with baskets full of fruits and flowers, full of incense, full of the sacred water from here, and they are offering this to us as a welcome gift. This is the abundance-the abundance of life, health, and the abundance of resources. We have all these gifts from the Gods.